I am writing this from the future. It is 2020 and I am sitting in my study, looking at a shelf that is practically bending beneath the weight of published novels—my name on each. Wow! The first one I spy, I remember starting way back in 2012 through NaNoWriMo. I made a pretty good job of that but by June 2013, so much had happened to thwart its progress, it languished, forgotten, on my computer for a while. I recall that I was a wee bit tired and felt powerless. Remember how I had to weigh socks and could not lift more than a bag of sugar? Remember the kettle and the orange? You do, only too well? Well, that time passed thankfully and by September 2013, I was almost back to my normal self and had actually caught up with that November novel and given it a new beginning. Looking back, there was still a lot of work to do on it but I was already in the middle of writing the second novel that I now see, sitting on the shelf. That one was fun to write you will recall though you had a few days of anguish with the characters and struggled to choose which tense you wanted it written in. You never were quite sure whether it was a children’s book or written for adults but it found its niche, never fear. I gave it a deadline of January 1st, never dreaming I’d manage to finish it by then. Well, be assured, I did! The other novels I managed to complete, stare back at me proudly, their spines straight, their titles winking at me in the sunshine that filters through the window. Each book represents months of toil and a certain amount of frustration as plots fell apart or the beginning I loved, failed to rouse me a second time. Still, I got over those hurdles and, as you see, some of those books have become best sellers. I spent yesterday signing the covers of my latest novel at Waterstones. It was a novel I began years ago, the one that I have re-written and re-written and almost gave up on in 2013. That and its three cousins, have all made it into print one way or another. I am now writing a trilogy, the third part of which, my readers eagerly await. Film rights are in the post. Hold on, I will just put the kettle on and let my dear old Golden Retriever waddle out into the garden before continuing. So, dear me, 2020 is looking good. However, as I am writing from the future, I would like to ask you, the self still back in 2013, would you please stop procrastinating and daydreaming (as a child, you had an uncle who always said you were a daydreamer) and pick up that pen or that keyboard and write? Just look at how good it is going to be here in the future! P.S. 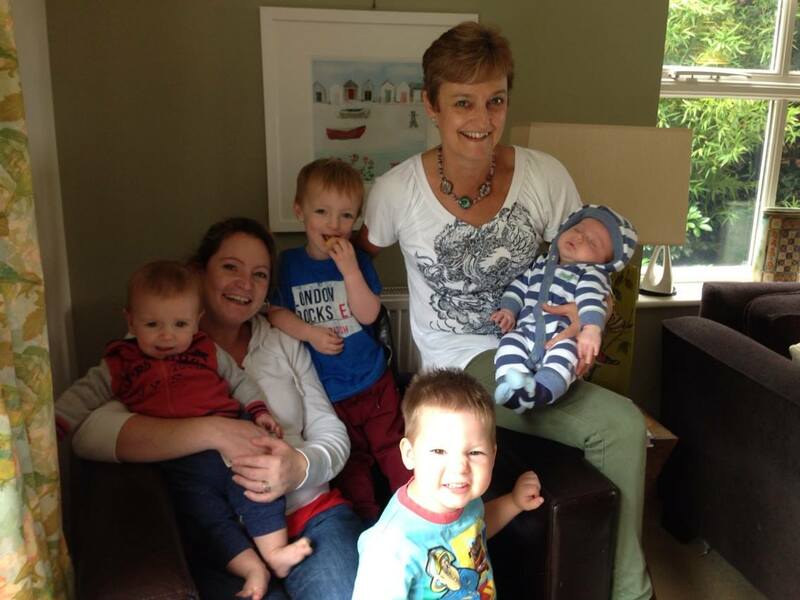 Weren’t the first four grandchildren cute in 2013? Oh Dear ME! I am in a slump right now of being tired of thinking about what I will do in the future…even a week from now! I am reading up a storm and definitely cleaning down the accumulations of living, and I am working on some flow of life – rather than being driven and pushing. Being fallow. What a beautiful family and glad to hear your are mending well. Thank you Patricia – there is something very therapeutic about stepping outside oneself for a while and I am pleased you are reading up a storm! I hope the reviews you write for my future books are as eagerly anticipated by your readers as those that I read now. There’s nothing like posting a new blog entry to get the forward momentum going. Life does have a way of interrupting, but those who enjoy writing will carry forward, as I know you will! Look forward to reading your next entry. Here’s to the future unfolding just as you’ve written here. I have every confidence that you can make it happen, and I look forward to seeing those same books on my shelf as well. Glad you’re feeling better. Dear Me, has it really been 10 years since I have been blog pals with my dear friend and successful author Deborah Barker. Her procrastination has paid off for her, after all said and done, like myself a born daydreamer, she has needed time to feed that vivid hungry imagination of hers. Long may she reign. Hi Debbie .. love the comments to your post – Dear me .. 7 years away: equals DEAR ME indeed!!!!! So pleased life is settling down .. and your Rugby team is progressing .. perhaps there’s a hockey one in there too!! Great to be able to watch those little scamps grow into peoples like us? !